Diego Simeone believes Atletico Madrid will grow after finally ending their misery at the hands of city rivals Real Madrid in European finals. Atleti were bested in extra-time and on penalties respectively by Los Blanco in the 2014 and 2016 Champions League finals. 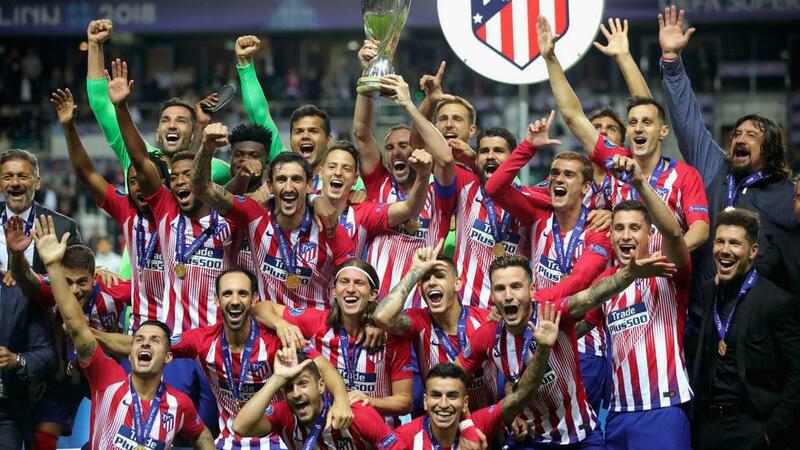 An additional period was also required during Wednesday's UEFA Super Cup clash in Tallinn, but a spectacular strike by Saul Niguez and a game-sealing effort from Koke shortly afterwards gave Simeone's men a 4-2 victory. "Real hadn't lost an international final since 2000," he said, having watched Diego Costa's earlier brace from the stands due to a UEFA touchline ban. "In the previous finals against them the little details were against us, so that's why we could not win the finals. "We had already beat them in the  Copa del Rey final and the  Supercopa de Espana, and now we beat them also in Europe. This will make us stronger and we will celebrate it." Simeone reserved special praise for Costa, who returned to Atleti from Chelsea last year and will spearhead the bid to repeat 2013-14's remarkable LaLiga title triumph. "It was an extraordinary night from Diego Costa, [he] made us stronger," he added. "After the [equaliser for] 2-2 the team believed more and more. With this great squad we have, we need everybody involved. "If all our players are in good condition, our possibilities are higher."